– What Is The Difference Between Open-Ended and Closed Back Screw Posts? 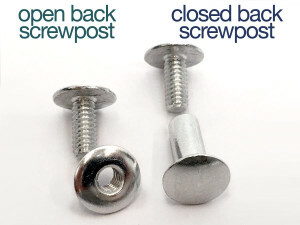 What Is The Difference Between Open-Ended and Closed Back Screw Posts? When looking at binding with screw posts, a term that comes up for smaller size capacities is ‘open-ended’ and we get a few questions asking what the difference is between that and the closed end backs of the posts. The smaller capacity screw posts have a hole in the cap dome of the rear barrel posts. The sizes with this open end are from 1/8″ to 3/8″ in capacity. The 1/4″ and larger all have a closed back. You can see the difference in the photo above. This hole really has no impact on the function and usability of the screw posts. To learn more about binding with screw posts, click below to watch our video: All You Need To Know About Screw Post Binding. ← Question Corner: Should I Use Padding Compound To Glue Carbonless Forms Together?